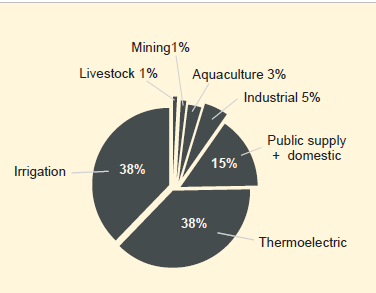 The amount used for fracking – and indeed all oil and natural gas development – pales in comparison to the 38 percent used for irrigation, and is only a fraction of what’s used for other domestic and municipal purposes. Low comparative water use for fracking is the reality in other states, too. In Colorado, for example, a joint report found that just 0.08 percent of state water was used for hydraulic fracturing in 2010. And in California, which is suffering from severe drought, water use in fracking is negligible. Anti-fracking groups recently pointed to a Reuters report from July that claimed fracking operations used 70 million gallons of water in 2014, but that was barely a drop in the bucket compared to the 35 billion gallons of freshwater withdrawals per day by California in 2010 as reported by a 2014 USGS study. In conjunction with technological development, increased water management strategies, such as reuse and recycling of produced water or the use of more brackish water that is too salty for human consumption, further decrease the amount of freshwater used in fracking. Companies are even helping drought stricken farmers in California with the sale almost eight billion gallons of water last year. This GAO report again confirms that natural gas – both its development and its use – is not a major consumer of water. Not only does fracking use a relatively insignificant amount of water each year, but new technologies and water management strategies are also helping to further reduce freshwater usage. Additionally, natural gas-fired electricity results in considerably less water consumption as compared to other conventional fuel sources, making natural gas an economical and responsible choice.